St. Anthony's stat man Tom Langan. Title: St. Anthony’s Stat Man Shows Grit; Friars football statistician Tom Langan roams the sideline despite losing leg to infection and diabetes. You know Tom Langan. He’s the guy with an infectious smile, clip board in hand and numbers at his fingertips, navigating the pulsing sideline at St. Anthony’s football games as he keeps pace with what’s happening on the field. 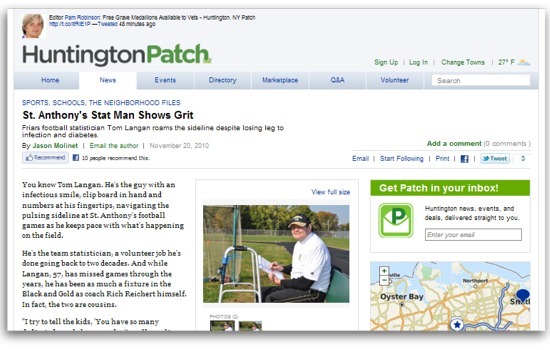 He’s the team statistician, a volunteer job he’s done going back to two decades. And while Langan, 57, has missed games through the years, he has been as much a fixture in the Black and Gold as coach Rich Reichert himself. In fact, the two are cousins. St. Anthony’s (10-0) plays Iona Prep (8-2) in the CHSFL Class AAA championship game Saturday at 4 p.m. at Mitchel Athletic Complex in Uniondale. It’s no surprise Langan will be there doing his duties for the Friars. The remarkable part is that Langan is here at all. The same day St. Anthony’s beat Iona Prep on Oct. 9, 2009, Langan’s left leg was amputated above the knee. It was the result of a freak infection gone wrong and a previously undiagnosed condition. Reichert gave his cousin the game ball in the hospital. He stopped in every night after practice. And he’s been there for Langan ever since, through a long and evolving rehabilitation process. His big step forward came during the home opener in September against Holy Cross. Langan made his return to the St. Anthony’s sideline, albeit with his clip board balanced on a walker. Langan, who is still adjusting to using his titanium prosthesis, recently transferred from a rehab facility in Long Beach to an assisted living home in Medford. Each day is another closer to normalcy. Today Langan’s life is packed away, boxed up in Reichert’s garage. He was an only child and never married. The football program is his family. Langan finds deeper meaning in everything now, especially on the sideline of a football game. It’s one small but significant step in the rehabilitation process. It’s not the first time. When Langan’s father died in 1964 – when Langan was all of 10 – Reichert’s dad took on the role of surrogate father figure. So the cousins spent a lot of time together and grew as close as brothers. This is Reichert’s 24th season at the helm of the St. Anthony’s football program. Langan joined him on the sideline starting in 1991. The closest he had been to a sports venue was as a vendor at Yankee Stadium growing up in the Bronx. But Langan took instantly to his statistician duties. There were unexpected benefits. The winning was addictive. Being close to his cousin was great. He forged lasting relationships with the coaching staff. And the positive energy flowing from the teenaged players energized him. That family has seen him though an ordeal. When Langan discovered a pebble embedded in his left foot, he removed it with tweezers. It drew a little blood. He bandaged it up and didn’t think twice about it. That was August 2009. But the wound became infected. Langan ignored it, expecting it would get better. Then the infection spread to the bone. Next thing Langan knew he was unable to get out of bed. He called his cousin. Reichert rushed his cousin to St. Catherine of Siena Medical Center in Smithtown. Langan was diagnosed with Type 1 diabetes, which only exacerbated the injury. And his leg would have to go. Surgery was scheduled just 24 hours later. All that seems like a lifetime ago. Langan has been to five games this season. He was on the sideline when Reichert won his 200th game last week. The title game will make six. He has a job to do. Sometimes it’s easy to overlook the courage of the everyday. On the same turf where athletes push themselves to the limit for the glory of sport, so is the humble stat guy. He’s simply learning to stand tall and walk once more. There’s little doubt that the Catholic football league is the toughest and most talent-rich in New York state. There’s also no contesting that one school sits atop the heap. St. Anthony’s High School in South Huntington is a Long Island football dynasty with all the trappings of royalty. Coach Rich Reichert has one of the biggest and most experienced staffs you’ll find on a high school field. The 80-man roster is as deep as any college program’s. And the Friars play on a lighted, turf field before packed crowds approaching 2,500, and with TV and radio crews regularly stalking the sidelines. Little wonder the Friars, despite graduating several key players from last season’s 10-1 CHSFL Class AAA championship, are the top seed and favorites once again. Success breeds success. Behind the play of QB Tom Schreiber, the Friars won eight games in a row to end the 2009 season. He engineered a pair of fourth-quarter touchdown drives to lift St. Anthony’s past previously unbeaten Holy Trinity, 28-21, in the title game. It marked the eighth league championship in the last nine seasons. St. Anthony’s: The Friars will look to reach the CHSFL Class AAA title game for the 12th straight season with a new QB but the same unbeatable attitude. The difference maker for the Friars is up front, where their defensive and offensive linemen play on one side of the ball and have the heft to dominate. Holy Trinity: Can the Titans fill the void left by the graduation of all-everything RB / LB Anthony Brunetti? The four-year star served as the sparkplug for Holy Trinity’s run to the CHSFL Class AAA title game a year ago. If Holy Trinity lets QB Chris Laviano air it out, then look out. Chaminade: The 2009 season ended with Holy Trinity returning a blocked field goal for a touchdown with 18 seconds left in a 28-24 playoff loss. You can bet second-year coach Stephen Boyd, a former Pro Bowl linebacker, will have the Flyers playing inspired defense. Chaminade will be in every game. Holy Cross: A semifinalist a year ago, Knights have top wideout Devon Cajuste (921 yards, 7 TDs) back. Holy Cross gave St. Anthony’s a scare in the regular season but bowed out with an injury-riddled lineup in a 28-7 playoff loss to the Friars. This cast will be motivated for more. Mount St. Michael: Thanks to a No. 9 seed and easy schedule, look for the Mountaineers to play their way into the Top 8 and a spot in the CHSFL Class AAA playoffs. Veteran coach Mario Valentini gets his team to play and Mount finished strong in 2009 with a AA title. Multitalented QB Jaylen Amaker leads the offense. Think sleeper. Devon Cajuste, Holy Cross, WR: The 6-4, 211-pound senior was unstoppable a year ago as an NYSSWA first-team All-State pick. He led the CHSFL in receiving with 921 yards and 7 TDs on 40 catches, good for 23 yards a reception. Committed to Stanford. Isaiah Kearney, Xaverian, RB: After a standout freshman year in which he averaged 8.2 yards per carry and rushed for 774 yards and 6 TDs, all of Brooklyn is buzzing over Kearney. The sophomore back is sprinter fast and a true game breaker. Chris Laviano, Holy Trinity, QB: MaxPreps calls him a Top 100 recruit. This 6-1, 180-pound sophomore will be the focal point now that 2,000-yard rusher Anthony Brunetti is gone. He threw for 1,122 yards and 8 TDs in 2009. He’s got a big arm and a heady sense of the game. Poised for a breakout year. Tyler McLees, St. Anthony’s, LB: The 6-0, 210-pound senior led the league with 121 tackles a year ago and added 4 sacks. The son of former Carey coach Matt McLees (himself a linebacker at Southern Connecticut), he’ll be a leader on defense. Charlie Raffa, St. Anthony’s, QB: An Under Amour All-American in lacrosse, the 5-10, 185-pound Raffa has great instincts. And like his predecessors, he can beat you with his arm or legs. Committed to Maryland for lacrosse. Farrell at Kellenberg, Sept. 18: This is as important a game as Kellenberg will play all season. If the No. 11 Firebirds hope to qualify for the CHSFL Class AAA playoffs, then a win against No. 8 Farrell is a good place to start. Holy Cross at Holy Trinity, Oct. 16: Holy smokes! A pair of CHSFL Class AAA semifinalists from a year ago collide. Buckle up. This one should be fun to watch. Chaminade at Holy Trinity, Oct. 9: These Nassau rivals have met in the playoffs two of the last three seasons. It’s always close and heated. The winner of this game could be in the driver’s seat for a home playoff game. St. Anthony’s at Chaminade, Oct. 16: This rivalry defines the two schools. While Chaminade hasn’t been a factor of late, there’s no one the Friars would rather beat. But it’s the middle of a tough stretch in the schedule for St. Anthony’s. Expect a physical and emotional game. St. Anthony’s at Holy Trinity, Oct. 23: A rematch of the 2009 CHSFL Class AAA title game. St. Anthony’s has ripped the Titans in recent seasons (outscoring them 201-62 since 2005), bringing Holy Trinity back to Earth after sky-high expectations. This one will be for playoff seeding. Anyone who knew Howie Vogts understands this wasn’t the way the iconic football coach was supposed to pass on. Not in a hospital bed with an IV tube, heart monitor and respirator hooked up to him, as he did on Saturday at the age of 80 at Mercy Medical Center in Rockville Centre. No, after 56 years and a New York state-record 364 wins – all at Bethpage High School – it would have only been fitting if the giant of Long Island high school football expired during a game on the sideline. That’s how he would have wanted it, anyway. I spent enough time with him over the years to know that much. He was a man who could have long ago taken his pension and retired to Florida with his longtime partner, Marilyn Murphy. And he did. But each August Murph and Howie would drive up I-95 in the comfort of their Lincoln Town Car and return to their Bethpage house in time for the start of football practice. Because Howie Vogts’ real home was the sideline next to his boys. Vogts never had children. Yet after 56 years of coaching football in this working-class Nassau town, an entire community looked at the coach with fatherly respect. A former Golden Eagles player, Erwin Dill, has served as the associate head coach to take the load off Vogts. Dill has manned the sideline for more than a decade while Vogts, in declining health, sat on the bench. It might have made for an awkward relationship if not for the selflessness of the staff. It was an arrangement an entire town embraced. People get pushed aside in life. You probably know someone who was shown the door before they were ready to leave, at work or elsewhere. People get old. They become expendable. Not Vogts. He was treasured – and rightly so. Vogts, a Sewanhaka and Adelphi graduate, started with a freshman team in 1952 and then christened the varsity one year later. He spent one season as an assistant coach at Michigan State in 1966, but returned to the Bethpage sideline next fall. That’s where he’s been ever since. This was a Grumman town. The Lunar lander was built in Bethpage. Aerospace was the life blood of the community. But the jobs left long ago. The other source of town pride? Football, of course. Bethpage won 35 regular-season league or conference crowns, 16 playoff titles and five Long Island championships. Vogts was the mastermind behind them all. Even in his later years, he would spend much of his weekdays sequestered in the film room breaking down the opposition. He had a keen football mind to the end. The death certificate will note Vogts died of congestive heart failure. But anyone who knows him will tell you no one had a bigger heart. How else do you explain a lifetime of devotion to one town and his boys? Note: Visiting Tuesday and Wednesday 2-5 and 7-9:30 p.m. at the Arthur F. White Funeral Home, 234 Broadway, Bethpage, NY 11714. A Memorial gathering will take place Thursday 11 a.m. at the Howard C. Vogts Football Field at Bethpage High School. In lieu of flowers, donations may be made to the Bethpage Football Dad’s Club. Bethpage High School, Stewart Avene, Bethpage, NY, 11714, in Care of the Bethpage Dad’s Club. BUFFALO—The stands at Canisius College had already cleared out. Hell, his entire team was long gone too. Hicksville High School rising senior Brandon Gamblin didn’t notice. He was locked in a duel with his own demons and an empty cage. It was nearly 10 p.m. on Friday night, a half hour after one of the more physically and emotionally draining games of lacrosse Gamblin had ever played. A midfielder on the scholastic boys lacrosse team representing Long Island at the Empire State Games in Buffalo, favorite Long Island had just suffered a heartbreaking loss to the Central region. The 8-7 defeat in sudden death overtime fell squarely on an offense which hardly possessed the ball in the first quarter and failed to score in the first 22:53 of the game. Sure, Gamblin did his part. He broke the ice with a powerful blast of a goal early in the third quarter to make it 5-1 and restore some much needed confidence. But his shot was stopped by Central goalie Tyler White time and again in the second half. That’s why Gamblin stayed behind on a shadowy turf field bathed in the soft glow of the light towers, taking shot after shot at an empty cage. There’s no arguing with the result. Gamblin, a UMass commitment, played with a vengeance the rest of the way. After pouring in six goals to down New York City on Saturday, Gamblin proved just as unstoppable in the gold medal game on Sunday. He scored four times as Long Island (5-1) erased a 4-2 halftime deficit to beat previously unbeaten Central, 7-6. With the win, Long Island became the first region to earn gold in five straight Empire State Games since boys lacrosse became a sport in 1984. The Kyle Keenan-to-Gamblin connection was so fluid, you’d think they had been teammates for longer than one month. In the end, the relationships the Long Island scholastic boys lacrosse team built—starting with tryouts in June and continuing with 12 exhibition games in Maryland, New York, New Jersey and Pennsylvania – ended with a gold medal performance at the Empire State Games on Sunday in Buffalo. Keenan, an X attack, directed the offense with precision throughout the four-day tournament. That he had an uncanny ability to find fellow Smithtown West teammate James Pannell for open shots was no surprise. That he hooked up with Gamblin again and again spoke volumes of how well this team of all-stars meshed. Keenan fed Gamblin for three of his four goals on Sunday. It wouldn’t have been possible without the stellar play of Connetquot goalie Zach Oliveri (10 saves), who was in every respect the defensive stopper of the tournament. FOGO Jake Froccaro, a Port Washington junior, also played an important role after missing a game with a mild concussion suffered against Central. Even Oliveri couldn’t stop Central the entire time. Long Island was victimized for goals twice in the final 1:14 of the first half when Ithaca’s Riley Lasda spun off his defender and broke free in the box. His score was followed by Tom Grimm’s quick strike to make it 4-2 Central with 43 seconds left. Grimm, a Syracuse commitment from Carthage, had the game-winner against Long Island on Friday. The third quarter belonged to Long Island the entire tournament. This game was no exception. Pannell scored 1:39 into the third, and after pelting the Central goal with a barrage of shots, Garden City’s Tom Gordon scored the equalizer on a feed from Keenan with 4:01 left in the third. Gamblin juked past his defender and fired home the go-ahead goal to make it 5-3 with 1:37 left. Long Island kept up the pressure from there. Keenan found Gamblin charging toward the net and the Hicksville scorer did the rest to extend the lead to 6-4 with 10:52 to go. Fayetteville-Manlius attack Ari Waffle scooped in the rebound past Oliveri to make it 6-5 with 7:40 left. But the Keenan-to-Gamblin connection struck once more to keep Central at arm’s length. Gamblin scored his 18th goal in six-game tournament – and fourth of the day – with 6:52 left. Jamesville-Dewitt’s Alex Hatem scored his second goal of the day on a diving play at the net close the gap to 7-6 with 4:20 left. Long Island’s defense kept Central off balance from there. And after Central’s Austin Curtis received a one-minute penalty for slashing, Keenan and Sachem North’s Michael Andreassi held the ball and ran out the clock. All there was left to do was celebrate. As the son of two coaches, Kyle Keenan emerged from the womb with the DNA of an athlete and the mentoring to make it happen. The rising senior at Smithtown West High School is considered one of the nation’s top boys lacrosse players. It comes as little wonder considering his father, Sean Keenan, is the Smithtown West boys lacrosse coach. He played for Long Island legend Joe Cuozzo at Ward Melville and was an All-American at Adelphi University. The 5-11, 160-pound attack capped this third varsity season with a Long Island-best 53 assists in the regular season and a run to the Suffolk Class A semifinals. He committed last fall to reigning national champion Duke. And yet Keenan has another sports destiny just as deeply embedded. Bridget Keenan played for the Long Island open women’s soccer team at the 1992 Empire State Games in Albany. Twelve years after her first Empire experience, the ‘92 Games marked her final trip as a player. Unknown to her at the time, Keenan – an Adelphi grad who met her husband in college – was pregnant with her first child. The Long Island women’s soccer team earned a silver medal that summer. Kyle Keenan was born eight months later. Bridget Keenen coached the open women for three more summers then gave it up to focus on her growing family. “She was a big soccer player at the Empire State Games and she won a lot of medals,’’ Kyle Keenan said, proud of the family legacy. All these years later, Kyle Keenan battled through a tryout process unlike anything in high school sports – he was among 712 teenagers to try out for the Long Island scholastic boys lacrosse team – for the right to play at the 2010 Empire State Games. It was clearly important to him. He had heard the story of his mother playing pregnant at Empires too many times for it not to have an impact. So Keenan arrived early and was third in line to register for tryouts at Bay Shore High School. Yet the first day left him frazzled. Even still, Keenan’s ability shone through and he made an impression. He sailed through four rounds of tryouts to earn a spot on the final 20-man roster and fulfill his destiny. Keenan was so anxious, he stayed up past 2 a.m. awaiting the congratulatory email, checking his iPod Touch every few minutes. He’d chugged up and down the soccer field in his mother’s belly, competing at the Empire State Games. The five-day, Olympic-style festival has been going strong since 1978. Now he’s an Empire player himself, transforming the Games into a multigenerational celebration. The Long Island scholastic boys lacrosse team has already played nine games to prepare for the Empire State Games, which are in Buffalo from July 21-25. At the Tri-State Tournament in Princeton, N.J. on Saturday, Keenan scored twice against the Dukes – a travel team consisting of the best athletes from the Delaware Valley (Delaware, New Jersey and Pennsylvania) – to help Long Island finish the day 4-0. The Dukes featured several future Division I players, including fellow Blue Devils commitment Tanner Scott (Conestoga High School, Berwyn, Penn.). Two duo, along with Whitman midfielder Myles Jones, another Duke recruit, shared an embrace and some conversation afterward. At this elite level, Keenan proved he belonged. No doubt. It’s in the DNA. 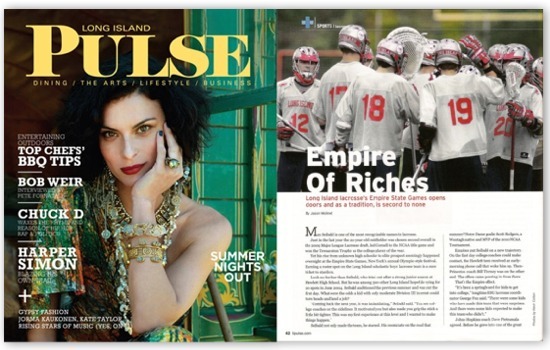 Long Island Pulse magazine July 2010 issue featuring Empire of Riches: Long Island lacrosse at the Empire State Games. Max Seibald is one of the most recognizable names in lacrosse. Just in the last year the 22-year-old midfielder was chosen second overall in the 2009 Major League Lacrosse draft, led Cornell to the NCAA title game and won the Tewaaraton Trophy as the college player of the year. Yet his rise from unknown high schooler to elite prospect seemingly happened overnight at the Empire State Games, New York’s annual Olympic-style festival. Earning a roster spot on the Long Island scholastic boys’ lacrosse team is a sure ticket to stardom. Look no further than Seibald, who tried out after a strong junior season at Hewlett High School. But he was among 500 other Long Island hopefuls vying for 20 spots in June 2004. Seibald auditioned the previous summer and was cut the first day. What were the odds a kid with only moderate Division III interest could turn heads and land a job? Seibald not only made the team, he starred. His roommate on the road that summer? Notre Dame goalie Scott Rodgers, a Wantagh native and MVP of the 2010 NCAA Tournament. Empires put Seibald on a new trajectory. On the first day college coaches could make contact, the Hewlett teen received an early-morning phone call that woke him up. Then-Princeton coach Bill Tierney was on the other end. The offers came pouring in from there. Johns Hopkins coach Dave Pietramala agreed. Before he grew into one of the great defensemen in lacrosse history and won two national titles as a coach, Pietramala was an unassuming junior at St. Mary’s High School. Then he earned a spot on the inaugural 1984 Empire State Games squad. The Empire State Games resumes in Buffalo from July 21-25 after a one-year hiatus forced by recession fears and a state-wide budget crunch. The event draws 7,000 teenaged and adult athletes in 33 sports and has been a summer staple since Gov. Hugh Carey opened the first Games in 1978. These Games are more cash conscious than ever before. Buffalo area businesses pledged $1.1 million in cash and in-kind support. And for the first time, ESG decided to charge athletes a $10 registration fee. While some grumble whether the Empire State Games should even move forward at a time when the state threatened to close parks, others are glad to see the Games back. They are a rite of passage, especially in the lacrosse community. For lacrosse players, the void was filled by the Long Island Showcase Games, an event sponsored by the Nassau and Suffolk coaches associations. As much attention as it garnered for the sport, the Showcase couldn’t replicate the Empire experience. That’s why a record 630 players showed up at ESG boys lacrosse tryouts in 2008, and why another 558 registered to compete for a Long Island roster spot by the end of May. And the alumni? A who’s who of lacrosse greats. Scholastic girls lacrosse, introduced to the Empire State Games in 2001, has medaled each year and won the last three golds. The girls boast the same talent, if not the tradition. With Fox at the helm, Long Island’s scholastic boys lacrosse team has developed into an elite program with a demanding schedule that’s served to sharpen any rough edges on the assembled talent. Five days of tryouts in each county were followed by a Top 50 game. The final team was announced with fanfare at Hofstra on June 25th. Then comes the hard part: A month of practice to go with three out-of-state tournaments. All of it serves as a warm-up to the Games themselves—five games in three grueling days in the heat of summer followed by a medal round at Canisius College in Buffalo. True enough. The 2008 Long Island squad drilled Western, 14-3, in the gold medal game. Rocky Point’s Matt Palasek scored five times and West Islip’s Nicky Galasso, the top prospect in the class of 2010, added a goal and three assists. To the chagrin of the state’s other five regions, the victory locked up Long Island’s fourth straight gold medal and 15th overall. The scholastic boys have medaled every year since the sport’s inception in 1984, a feat on par with the Harlem Globetrotters. As if playing for a college scholarship or Long Island pride weren’t enough, the 2010 team has a unique opportunity at history. “We’ve never won five golds in a row,” Fox said. One way or another, this collection of talent from every corner of Long Island will turn heads. Whether they bring home gold medallion keepsakes, or a scholarship offer or an unforgettable memory, the Empire State Games experience is rich and lasting. An SUV parked at Bay Shore High School last week was as obvious as a billboard. Scrawled on the rear window in blue and yellow paint: # 1 WI Lax NY State Champs. That’s right, West Islip was in the house. But these rock stars of boys lacrosse needed no introduction. West Islip won its second straight state Class A championship – and fourth in five seasons – with a 13-5 victory over western New York power Fairport on June 12, and claimed an even bigger prize in the process. The Lions were also crowned mythical national champs, according to LaxPower.com. So the large contingent of West Islip players – freshmen, sophomores and juniors – cut an intimidating profile among the hundreds of fellow Suffolk lacrosse hopefuls who showed up at Bay Shore to try out for both the Long Island Showcase and the Olympic-style festival known as the Empire State Games. When state budget concerns killed the Empire State Games a year ago, the Nassau and Suffolk coaches association scrambled to create the Long Island Showcase, all-star teams divided by grade and county. It was an instant hit. One year later the two events are sharing resources. The coaches associations have always played a key role in selecting the Empire squad. Now the athletes who don’t make the Empire team can still earn a spot on the Showcase roster. A record 712 teenagers showed up at tryouts last week at Syosset and Bay Shore high schools for the chance. Diggle didn’t make the cut. But in Suffolk, 113 athletes were invited back for a second round of tryouts on Monday, June 21. Eight West Islip players were among them, including star goalie Kyle Turri and his backup, Kelly. That’s all well and good on the West Islip lacrosse field. But at Bay Shore on Monday, the two were rivals. The backup and the star were still very much alive in the quest for an Empire jersey. No big deal. If West Islip is synonymous with anything over the last decade, it’s competition. After dropping the season opener, the Lions won 21 in a row and dominated in the playoffs. That confidence was evident at tryouts. Despite a turf field which seemed to soak up the heat and wear down the players, the West Islip contingent made its presence felt. The blue and yellow helmets each donned were impossible to miss. They always seemed to be around the goal. The field will be pared to the top 36 players in each county on Thursday, June 24 at 8:30 p.m. at Veterans Park in East Northport. The Empire State Games team, a 20-man roster with 10 alternates, will be announced the next day. The Long Island squad goes for its fifth straight gold medal at the Empire State Games in Buffalo from July 21-25. Don’t be surprised if one or more West Islip players are in the middle of it all. It’s what they do. 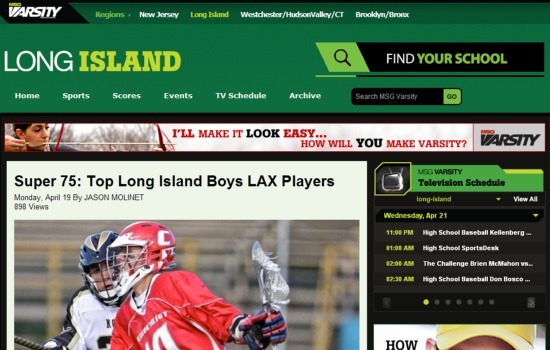 When it comes to high school boys lacrosse, no other region in the country compares with Long Island. 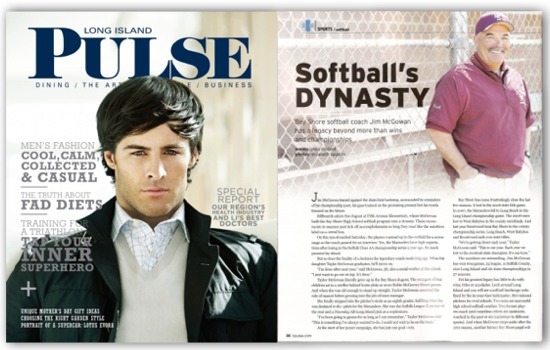 From tradition-steeped Ward Melville, the excellence of Catholic school rivals Chaminade and St. Anthony’s to the budding dynasty at West Islip, the breadth and depth of the sport on Long Island is impressive. The individual talent the Island produces each spring can only be compared with other heralded prospect-rich locales, such as South Florida football, Southern California baseball and New York City basketball. You want dominance? Look no further than the Empire State Games, where Long Island has won 15 of the last 25 gold medals. Gavin Ahern, South Side, Senior, Attack: This big lefty was an All-Nassau pick as a junior. He’s tied for the county lead with 25 goals in eight games. Signed with Penn State. Richie Akpinatis, Hauppauge, Senior, Goalie: This tough-to-score-on goalie is an intimidating 6-3, 245. The All-Suffolk pick as a junior signed with Manhattan. Michael Andreassi, Sachem North, Senior, Attack / Midfield: An All-Suffolk pick as a junior, Andreassi is a threat to score with either hand. The four-year starter has 20 goals in six games this spring. He put up nine points in a win over West Islip this season. Signed with UMass. Tyler Begley, East Islip, Junior, Attack / Midfield: This Hofstra-bound talent was a serious point scorer as a sophomore with 46 goals. He’s a big target. Drew Belinsky, Manhasset, Senior, Midfield: Led the Indians to the state Class C title a year ago. With seven starters from that team now playing NCAA Division I ball, Belinsky’s role has grown. Great athlete. Committed to Penn. Evan Bloom, Sachem North, Senior, Defense: Played in the Long Island Showcase. His defensive prowess showed in the team’s upset of West Islip earlier this season. Committed to Dartmouth. Tyler Brenneman, East Hampton, Senior, Midfield: One of the most prolific scorers in school history, Brenneman has 17 goals and 34 points in seven games this season. He scored three goals with four assists in a 15-11 victory over defending Long Island Class B champ Sayville. Signed with Notre Dame, where brother Zach is a junior. Trevor Brosco, Shoreham-Wading River, Sophomore, Midfield: A great faceoff man with soft hands who can shoot lefty or righty on run. A team co-captain who compares well to another SWR star: 2003 All-American Tony Ferriera. Ricky Buhr, Manhasset, Senior, Midfield: This Syracuse-bound talent is a faceoff machine and one of the cogs in last season’s state Class C championship team. Pat Candon, Holy Trinity, Junior, Attack: An All-NSCHSAA pick a year ago. This young gun already has 19 goals in CHSAA play. Jesse Chazen, Jericho, Junior, Attack: An All-Nassau pick as a sophomore, Chazen has emerged as a true offensive force this spring. He’s tied for the county lead with 25 goals in seven games. Steven Christofides, Glenn, Senior, Goalie: Played in the Long Island Showcase last summer. Christofides made 20 saves in a 10-3 win over Huntington this season. Enough said. Headed to Limestone College. Tom Cleary, Comsewogue, Senior, Midfield: All-Suffolk pick as a junior is headed to Dowling. A true scorer, the 6-1 Cleary is fast and boasts a hard shot. Scored 25 goals a year ago. Austin Cohen, Glenn, Senior, Defense: A rugged, 1,000-yard running back in football, Cohen was an All-Suffolk pick in lacrosse a year ago. He’s an Under Armour Long Island All-Star. Headed to Dartmouth. Eddie Collins, Long Beach, Senior, Goalie: Led Long Beach to 2008 Nassau Class A title game and was an All-Nassau pick as a junior. He’s an Under Armour Long Island All-Star. Ryan Curley, Eastport-South Manor, Sophomore, Attack: Starred in the Long Island Showcase sophomore game and has opened the season in impressive fashion with 23 points in seven games. Greg Danseglio, St. Anthony’s, Junior, Defense: IL’s No. 15 junior after helping the Friars win the state CHSAA title a year ago. Already committed to Virginia. 21 goals and 32 assists on the lacrosse field. This Under Armour Long Island All-Star is headed to Maryland. Tom DeNapoli, Lynbrook, Senior, Attack: An Under Armour Long Island All-Star, DeNapoli is among the Nassau scoring leaders with 31 points in eight games. He is headed to Towson. Ryan DeSimone, Smithtown East, Junior, Attack: IL’s No. 22 junior has already committed to Villanova. Al DeStefano, Ward Melville, Senior, Midfield: Team co-captain and speedster. Also an impact player in football and indoor track. Committed to Army. Devin Dwyer, Garden City, sophomore, Attack: Rated one of IL’s Rising Sophomores, Dwyer was an All-Nassau pick as a freshman and a top assist man. He sees the field and is a crisp passer. Mike Ehrhardt, Chaminade, Senior, Defense: IL’s No. 45 prospect and an Under Armour Long Island All-Star. He was an All-Long Island football player. Signed with Maryland. Brian Fischer, Garden City, Junior, Defense: IL’s No. 18 junior was part of Garden City’s Nassau Class B title team in 2009. Was named a U.S. Lacrosse All-American as a sophomore. Already committed to Harvard. Jake Frocarro, Port Washington, Sophomore, Attack / Midfield: An IL Rising Sophomore and the brother of Princeton’s Jake Frocarro. He’s among the Nassau goal scoring leaders with 17. Nicky Galasso, West Islip, Senior, Attack: The nation’s No. 1 prospect, according to Inside Lacrosse. West Islip has won three of the last four state Class A championships. He was named Newsday player of the year after scoring 71 goals and 136 points. Galasso is off to another fast start with 21 goals and 33 points in six games. Galasso signed with North Carolina, the gem of IL’s top-ranked college recruiting class. Jake Gambitsky, Wantagh, Junior, Goalie: IL’s No. 38 junior is drawing a lot of attention from recruiters. He recorded 20 saves in a win over Lynbrook this season. Brandon Gamblin, Hicksville, Junior, Midfield: Scored five goals in Long Island championship loss to West Islip a year ago to finish with 36 on the season. Strong on defense. Nick Giampaolo, Ward Melville, Senior, Attack: Opened the new season on a tear, with 17 goals and 25 assists. Signed with D-I Bryant. Nick Gibaldi, Rocky Point, Senior, Goalie: From backup to starter, there are high expectations for Gibaldi. The talent is there. So far so good. Signed with Wagner. Robert Goeren, Massapequa, Senior, Midfield: Currently among the Nassau scoring leaders with 27 points, he had three goals and three assists in an upset of defending champ Baldwin. Signed with D-I Bryant. Zak Goldbach, Plainview JFK, Junior, Attack: Ranked No. 50 in IL’s junior class. He’s among the Nassau leaders with 24 points in seven games. Tom Gordon, Garden City, Junior, Attack / Midfield: Helped lead Garden City to the Nassau Class B title last season. Three-year starter and great finisher. Already committed to Johns Hopkins. Austin Heneveld, East Hampton, Senior, Attack / Midfield: Has already recorded 29 points in East Hampton’s high-scoring attack. Headed to Navy. Will Himler, Chaminade, Senior, Attack: IL’s No. 9 prospect. Himler had 15 points and 27 a year ago. He already has 13 assists this season. Headed to Princeton. Andrew Hodgson, West Islip, Senior, Attack / Midfield: This Towson-bound talent is IL’s No. 10 prospect. Hodgson came up big down the stretch of West Islip’s state Class A championship run. He had four goals in the county title win over Ward Melville and two more in the state final against Orchard Park. Adam Hull, Smithtown East, Senior, Attack / Midfield: Starred in the Long Island Showcase game last summer. He has 25 points in six games this season. Headed to Dartmouth. Stephen Jahelka, Garden City, Junior, Defense: IL’s No. 8 junior and member of the Trojans’ Nassau Class B championship team last season. This three-year starter is tough, as evidenced by his Newsday All-Long Island selection at linebacker. Already committed to Harvard. Myles Jones, Whitman, Junior, Midfield: IL’s No. 6 rated junior, the 6-4 Jones is a pure athlete and unstoppable one-on-one. He helped Whitman upset Ward Melville this season. Kyle Keenan, Smithtown West, Junior, Attack: IL’s No. 41 junior. Keenan is second in Suffolk with 38 points (25 assists) through six games. He forms a great tandem with James Pannell. He’s an early commitment for Duke. Tom Kelly, Rocky Point, Senior, Midfield: Kelly was part of a state Class B championship team in 2008, but the season ended in the Suffolk semis a year ago. The faceoff master signed with powerhouse Virginia. He’s out injured, but should be back for the playoffs. Christian Kennedy, Cold Spring Harbor, Senior, Midfield: IL’s No. 37 prospect. An All-Nassau pick a year ago, Kennedy has 10 goals in six games this season. Committed to Georgetown. Matt Kunkel, Ward Melville, Senior, Defense: A three-sport athlete and an All-Suffolk selection as a junior. He’s considered a lock-down defender. Signed with Duke. James Lang, Hicksville, Senior, Defense: Key member of Nassau Class A championship team last season and defensive MVP of the county final. An All-Nassau pick and Under Armour Long Island All-Star. Signed with St. John’s. Cam Lee, Cold Spring Harbor, Junior, Midfield: This lefty is an important cog in the Seahawks’ attack. Lee is already committed to Duke. Joe Leonard, Hicksville, Junior, Attack: Leonard scored three times in the Nassau Class A title game, including the winner, to beat Baldwin a year ago. Once again Leonard is among the Nassau scoring leaders with 18 goals and 26 points. Already committed to UMass. Dylan Levings, Plainedge, Senior, Midfield: All-Nassau player for county Class B semifinalist last season. This faceoff dynamo is an Under Armour Long Island All-Star. Committed to Yale. Joe LoCascio, St. Anthony’s, Junior, Midfield: IL’s No. 29 junior. Has 13 points so far. Both his father and uncle were D-I lacrosse players. Already committed to Maryland. Zach Losco, Hauppauge, Senior, Midfield: Ran the 55 meters during the indoor track season, so he’s a burner. Among the Suffolk scoring leaders this season with 13 assists and 26 points. Headed to Penn. Sean Mahon, Chaminade, Junior, Midfield: IL’s No. 37 junior has been a leader at each level. He was Chaminade’s freshman (2008) and JV (2009) team MVPs. Has 7 goals so far. Brandon Mangan, Wantagh, Senior, Attack: This two-time All-Nassau pick scored 56 goals and 29 assists a year ago. He’s an Under Armour Long Island All-Star. Committed to Yale. Will Mazzone, Ward Melville, Junior, Attack: IL’s No. 26 junior. Mazzone has 10 goals and 19 points in a deep lineup. Committed early to Army. Kieran McArdle, Connetquot, Senior, Attack: Great assist man has formed quite a one-two punch with fellow senior Matt McQuade. He currently leads Suffolk with 28 assists and 46 points. Signed with St. John’s. Sean McCann, St. Mary’s, Senior, Midfield: All McCann has done is explode for 30 goals in five games, leading the CHSAA and propelling St. Mary’s to a 5-0 start. He’ll join brother James at Belmont Abbey College. Dan Mellynchuk, Sayville, Senior, Defense: Helped Sayville to the Long Island Class B title a year ago. Signed with Maryland. Maxx Meyer, Half Hollow Hills East, Senior, Midfield: Long stick specialist is IL’s No. 24 prospect. He was a Newsday All-Long Island pick as a junior, contributing 12 goals. Committed to Penn. Chris Moriarty, Cold Spring Harbor, Junior, Midfield: Scored in the Nassau Class C title game a year ago. Has 5 goals and 7 assists this season. Already committed to Penn. Brandon Noblett, East Meadow, Junior, Attack: An outstanding center in football, this brick wall on the lacrosse field is physical — and deceptively fast. Zach Oliveri, Connetquot, Senior, Goalie: This elite stopper has Connetquot soaring with 17 saves against Sachem North and 15 more against Ward Melville. Signed with UMass. James Pannell, Smithtown West, Sophomore, Attack: An IL Rising Sophomore with great instincts. Naturally, older brother Rob plays at Cornell. He has 14 assists and 27 points so far. Ryan Payton, Floyd, Senior, Attack: Talented lefty is among the top Suffolk goal scorers with 18. Signed with Manhattan. Michael Pellegrino, Connetquot, Junior, Defense: IL’s No. 19 junior is a two-time All-Suffolk pick and a physical presence. Already committed to John’s Hopkins. Kyle Rebman, Baldwin, Senior, Attack: Led Baldwin to a Nassau Class A title game in 2009, tallying 59 goals and 26 assists. He’s currently second in Nassau with 39 points and third in goals (23). The All-Nassau pick signed with Jacksonville. Mike Rooney, East Islip, Senior, Attack: QB for county finalist football squad. He’s already proving to be a great one-two tandem with teammate Kevin Wendel. Rooney has 29 points and 16 assists in six games. Tim Rotanz, Shoreham-Wading River, Freshman, Attack: Started as eighth grader on senior-laden team. He’s a 5-11 lefty, the son of coach Tom Rotanz and plays like it. Great vision and hard driver to the cage. Rotanz has 15 goals and 11 assists in five games. Jimmy Ryan, Ward Melville, Senior, Midfield: Missed the entire regular season with a back injury as a junior. Ryan has gotten off to a solid start in 2010 with 5 goals and 7 assists in seven games. Played RB in football. Committed to Colgate. Eric Schneider, Massapequa, Senior, Goalie: IL’s No. 33 prospect had 15 saves in a big win over defending Nassau Class A champ Baldwin this month. Schneider was an All-Nassau pick as a junior. Signed with John Hopkins. Tom Schreiber, St. Anthony’s, Senior, Midfield: Newsday All-Long Island pick and U.S. Lacrosse All-American as a junior and IL’s No. 4 prospect. He led the Friars to a CHSFL football title at QB, so he’s tough and clutch. Headed to Princeton. Brendan Schroeder, St. Anthony’s, Senior, Attack / Midfield: This sure-handed talent played WR on a championship football team and is IL’s No. 49 prospect. He’s headed to Navy. Derek Sganga, Eastport-South Manor, Junior, Defense: This lefty has gotten rave reviews from rival coaches for causing havoc. An excellent defender with a knack for timely goals too. Kevin Teresky, Whitman, Junior, Attack: Played in the Long Island Showcase last summer. He is the second-leading goal scorer in Suffolk with 24. Doug Tesoriero, Syosset, Senior, Midfield: Helped Syosset reach the state Class A title game as a sophomore. Off to a fast start with 14 goals in seven games for the Braves. Committed to Cornell. John Urbank, Chaminade, Senior, Defense: IL’s No. 36 prospect and a key part of Chaminade’s run at a 2010 state CHSAA title. Signed with Georgetown. Younger brother Paul is a rising sophomore. Kevin Wendel, East Islip, Junior, Midfield: It’s been a big junior year so far. This prolific scorer has already amassed 20 goals and 27 points in six games. And he’s already committed to Navy. Alex Zomerfeld, Comsewogue, Senior, Midfield: Three-year starter and All-Suffolk pick a year ago. He’s a selfless player, just as happy getting the assist as scoring, according to coach Pete Mitchell. QB on the football team. Signed with Bryant.